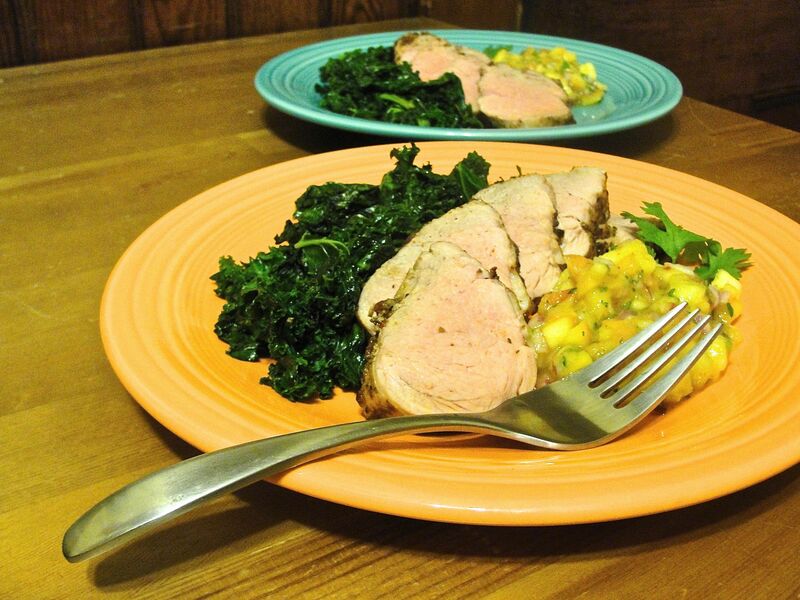 Chipotle Pork Tenderloin with Peach Salsa and sautéed kale greens. While planning dinner for two, my partner and I realized we had a few too many ripe fresh peaches, so decided to make a spicy fruit salsa for meat, resulting in this nice summertime meal: chipotle pork tenderloin with peach salsa. 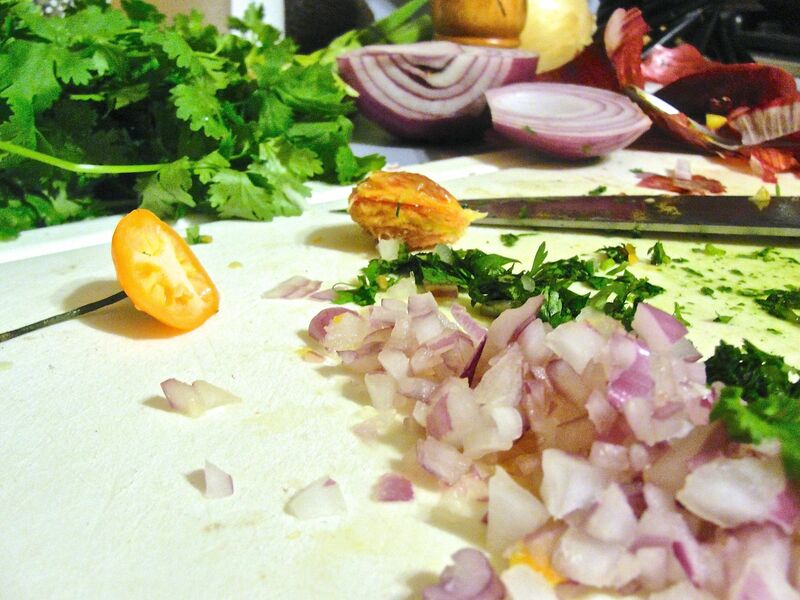 Preparing the salsa: fresh habanero, red onion, and cilantro. She prepared the salsa to generously serve two; the salsa consisted of three ripe peaches, pitted, and diced (medium, with skin intact), diced red onion, and finely chopped fresh cilantro, about 1/2 finely chopped fresh habanero pepper (seeds and veins removed), a touch of sugar and apple cider vinegar, and finally salt and a touch of powdered cumin and chipotle pepper, to taste. 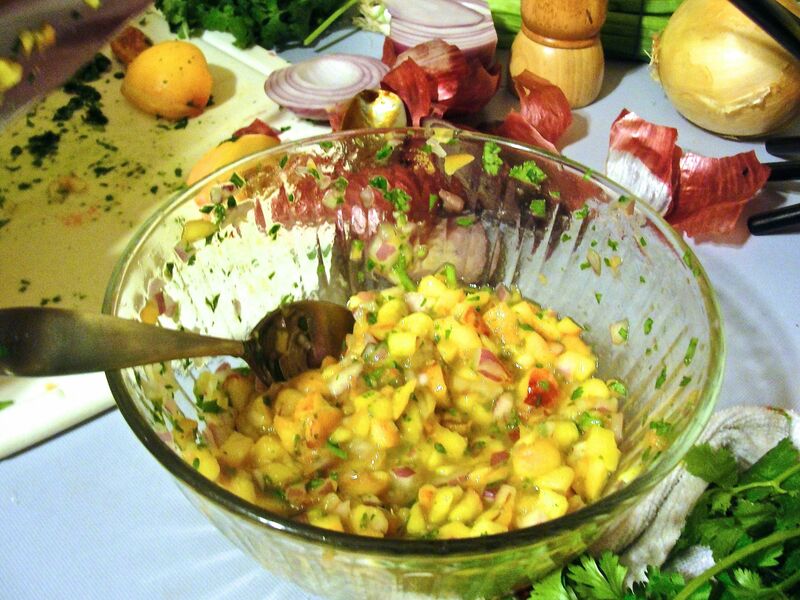 Fresh Peach Salsa with Habanero. I slathered a fairly small pork tenderloin with olive oil and finely chopped chipotle chile en adobo (from a can), browned it in a hot skillet, seasoned it with salt pepper and a bit of adobo seasoning, then placed the loin (whole) in a lightly-oiled glass baking dish and cooked in a 350° F oven for 30 minutes. This typically yields a spectrum of doneness: from medium on the narrow end to medium rare on the thicker end, so plan accordingly with a few more minutes baking time, if you prefer it more well done. We let the pork rest for about five minutes, then sliced it into medallions. Our kale greens were simply sautéed in olive oil in a skillet (first covered, stirring occasionally, then uncovered for the final minutes to desired doneness) over medium low heat, and seasoned with salt and pepper. We plated each serving with five or six pork medallions, a generous amount of the salsa, and garnished with a cilantro sprig. 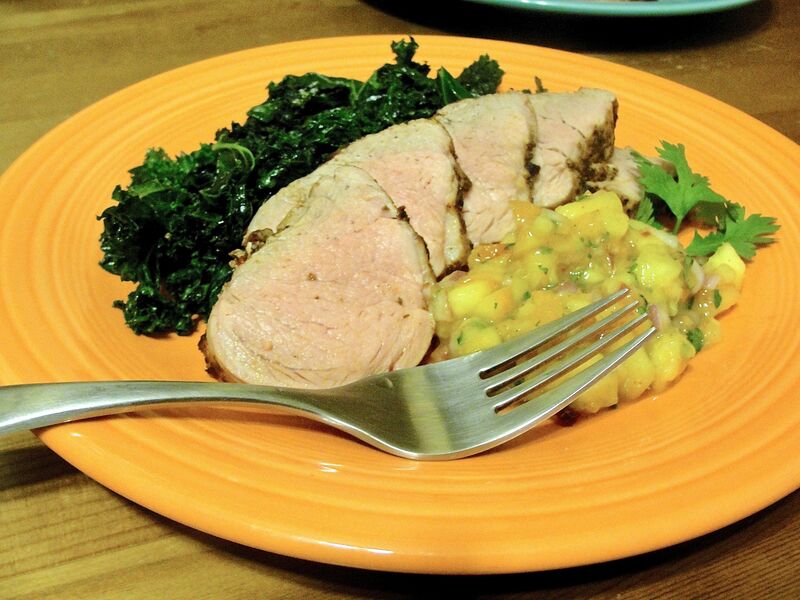 Chipotle Pork Tenderloin with Fresh Peach Salsa and sautéed kale greens. There are a lot of variations on this pork tenderloin dinner for two that you might like to experiment with as well, such this nice Mustard and Black Pepper Pork Tenderloin. Here’s an easy but great meal, whipped up last night with some wonderful companions. We shopped at the market quite late, but found a nice Lake Superior Trout fillet (wild, frozen) large enough to serve three, after the seafood counter had closed. Prepare a sauce for the trout from yogurt (plain, thick yogurt, e.g., greek style, perhaps 1/2 cup), finely chopped chives or garlic grass, Worcestershire sauce (~1-2 T.), lemon pepper, salt to taste. Here, we used garden-fresh garlic grass from a friend. Place the (thawed) trout fillet(s) in a baking dish and coat the top with the sauce, perhaps with a small amount of olive oil underneath to assure it doesn’t stick to the dish when cooking. A tip: if you leave a large fillet whole, you can cut it to test for done-ness and cut into servings at the same time. Bake both the trout and kale in a 400° F, perhaps for 10-12 minutes for the trout and 5-7 minutes for the kale, until the fish is cooked through, but still moist, and the kale leaves are somewhat crisp. 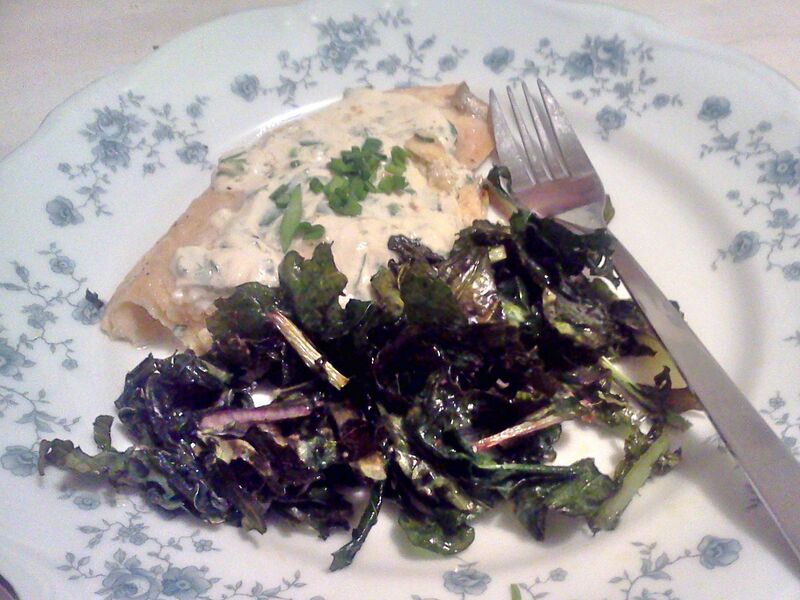 Toss the kale occasionally to cook/crisp evenly. We plated individual-serving-size portions of the trout, topped with a bit more finely chopped garlic grass/chives, and the crisp kale on the side, accompanied by a pretty insalata caprese (unfortunately, not pictured) of ripe, yellow tomato slices, fresh home-grown basil leaves, and sliced fresh mozzarella. 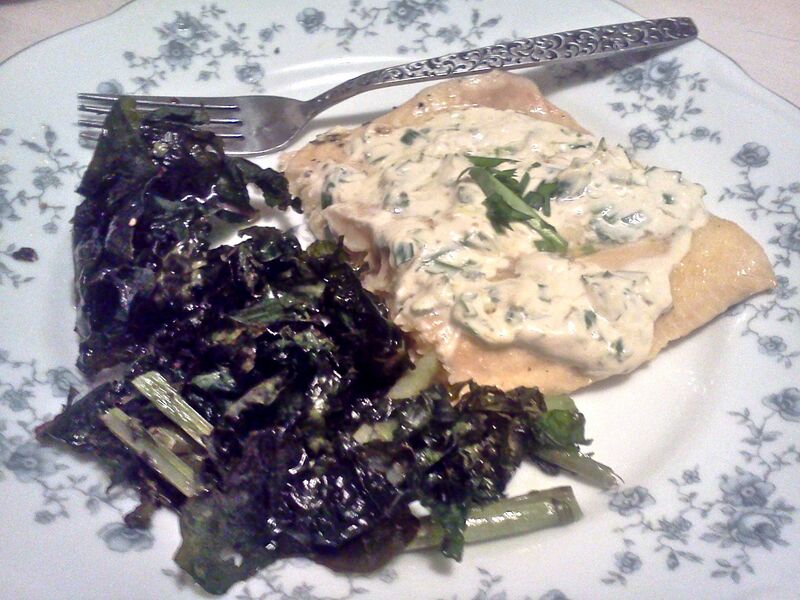 Lake trout with yogurt/garlic sauce and baked crispy kale. Note that the crispy kale can be prepared easily at many oven temperatures, e.g., 250° F – 400° F, to share the oven with your entree.